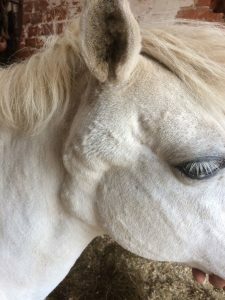 A melanoma is a type of tumour that arises from skin cells and may be benign or malignant; these tumours are usually associated with coat colour and occour most commonly in older grey horses. Melanomas are the third most common skin tumour in horses and it is estimated that up to 80% of grey horses develop some form of visible melanoma by 15 years of age. Melanomas have a characteristic appearance, generally being rounded, raised, hairless black nodules of various sizes and they are commonly found under the tail, in the perineal and genital region, in the salivary glands and on the lips; solitary nodules can be seen on the skin anywere on the body. Whilst usually considered to be benign, some are of malignant (cancerous) nature and have the potential to spread throughout the body; melanomas found on non-grey-horses are almost always malignant. Multiple nodular melanomas in the area of the parotid salivary glands and subauricular lymphnodes in an aged grey pony. Can we prevent the onset of melanomas? Unfortunately, there is currently nothing that can be done to stop horses from developing melanomas. Unlike humans melanomas, ultravioliet light is not thought to be linked to the development of these tumours. 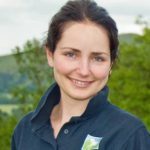 Traditionally equine melanomas have often been left alone rather than actively treated, because most of these tumours will follow a benign, lengthy clinical course and do not tend to cause pain or other problems in the early stages. However, the chance of eventual malignancy or clinical problems even in benign melanomas is high, especially in specific locations such as the perineum and the face and we know that early treatment is likely to be beneficial to slow down or even stop the progression of the tumour. A proactive approach and early treatment are therefore highly recommended, and the options may vary depending on the location and size of the melanoma. Surgical removal is often the preferred approach for early stage melanomas; tumours are typically removed in the standing horse under sedation using a laser to control bleeding. The remaining tissue is left to heal on its own, with daily wound care and application of topical creams if required. In some cases where the surgical approach isn’t feasible due to the location or size of the melanomas, chemotherapy agents can be injected locally; this approach has so far shown variable results. More recently, a promising new vaccine that has been licensed in the USA for treatment of melanomas in dogs has been provided for horses at high risk of developing melanomas. This is a DNA-based vaccine that stimulates the body to produce an immune response against a protein found in all melanoma cells. This means that all melanomas, even the ones that are not visible or accessible, are targeted by the vaccine. At present, the vaccine has been reported to promote reduction or even regression of the melanomas in some horses. Whilst awaiting for more clinical trials to investigate this type of treatment, the efficacy remains questionable. It is possible for horses at high risk to receive the course of vaccinations in the UK by specialists vets present across the country.